Train your organization more effectively. Run your business on your mobile phone. Call in easily – no codes or PINs required. Customizable remote support for enterprise businesses. Lightweight and affordable remote support. Get a 360-degree view of your customers’ journey. Remember one master password. Keep the rest secure. Provide anytime access to files and applications. Remotely deploy and automate IT tasks. Remotely access any computer, iOS or Android device. Sign into the web based agent console. Sign into the technician end point. Go from chat to remote control sessions where employees are already working with the Slack App integration. 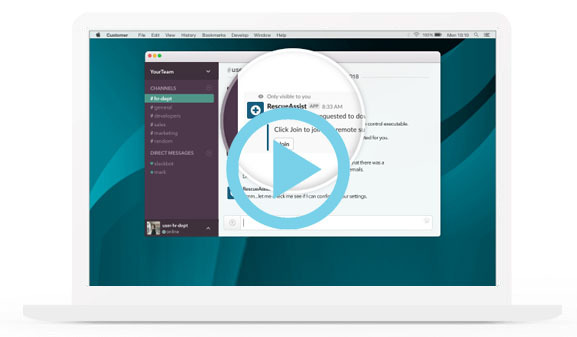 Keep your employees productive by assisting them where they work every day – in Slack. 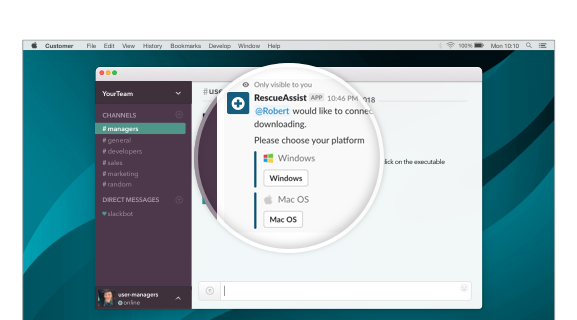 Employees can reach out to you through chat, and you can easily start a remote control session in the Slack interface using the built-in slash command -- /rescue -- without any installation. Resolutions are fast and fluid without jumping platforms, so they can get back to business with less interruption. With the Slack App Integration, agents can gain control of a remote PC, Mac, or mobile device in seconds. Agents simply initiate a remote support session during a Slack conversation to view the employee’s screen and take control. Connect to Slack in 3 simple steps. · Sign into your Slack account and "Add to Slack"
That's it. You and your end users are ready to chat with RescueAssist. 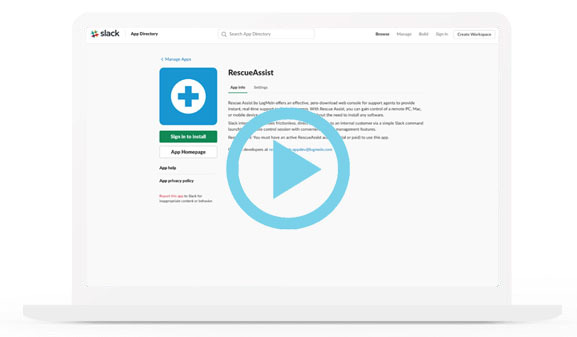 Tip: If end users don't see RescueAssist listed under Apps, remind them to click Browse Apps (the plus sign) to add it themselves.